When a room no longer fits a family’s lifestyle, that’s a good time to look into remodeling, says Lynn Havlicek, of Geneva Cabinet Gallery. So, you think you’re ready to remodel. You’ve had enough of that honey-oak cabinetry. Your oversized bathtub is forsaken. You want a kitchen that fits your growing family. But are you ready for what’s to come? 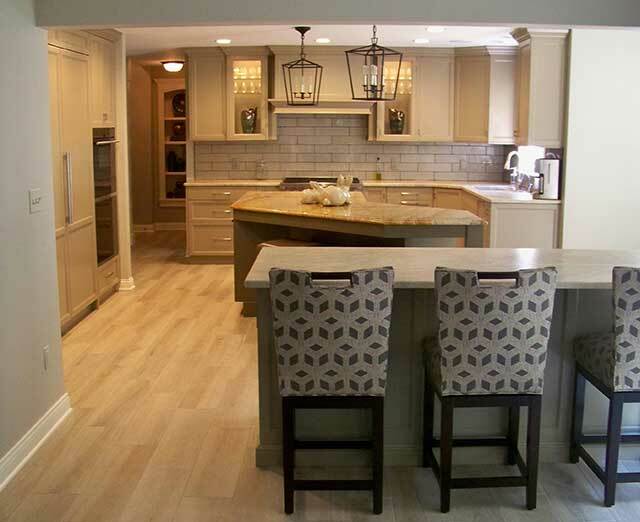 Are you ready to shop for a remodeler? Are you ready to select new materials and color schemes? Are you prepared to invest several months and a few thousand dollars working through design, demolition and construction on some of the most-used spaces of your home? There’s a lot to consider before jumping into a remodel, but with the right experts by your side, the job can be managed easily. Remodeling experts around our region have spent decades walking through this process day in and day out. They’ve seen challenges and encountered surprises. And, they’ve left hundreds of happy homeowners raving about their refreshed homes. Before you jump into a remodeling job, equip yourself with the proper questions and tools to get it done right the first time. There’s one question on Bob McDowell’s mind when he first meets a client: What’s your pain? Often, that inconvenience has interfered long enough with the family’s lifestyle. McDowell’s family-owned firm is currently updating a bathroom for an older couple. Bathtubs are a common point of conversation for Dave Wegner and Megan Lebar, designers at Blue Ribbon Millwork, in Woodstock. More and more, they’re hearing from clients who want to rip out that oversized bathtub that was so popular in the ’80s and ’90s. “One customer told me, ‘It’s our dirty clothes hamper,’” says Wegner. It’s not unusual for clients to hesitate. As much as it’s exciting, remodeling is scary, too. It’s tempting to make an update just before moving, to make a home even more marketable, but Lebar encourages clients to act earlier. “When you plan to sell the house in five years, it’s a great time to renovate so that you have time to enjoy it,” she says. For Lynn Havlicek’s clients at Geneva Cabinet Gallery, in Geneva, the biggest source of “pain” is the layout of a kitchen or bathroom. It could be that it’s too small or cramped, or it could be that a peninsula is disrupting the movement of people. Now that you’re ready, it’s time to do some research. Seek out expert advice, ask your friends, and brush up on some home remodeling television. Look for pictures of beautiful kitchens, and save your favorite images. But take everything with a degree of skepticism. Things aren’t always what they appear to be. Be careful what you see on TV. Plenty of shows tell you the cost of a project, but those numbers are misleading. Not only are materials and labor costs in the Chicago area different from those in Texas or Canada, where many television shows are taped, but there are also hidden costs to know about. Before you set in, it’s also important to know where your priorities lie. Knowing in advance what’s most urgent will help to make the most of your budget. 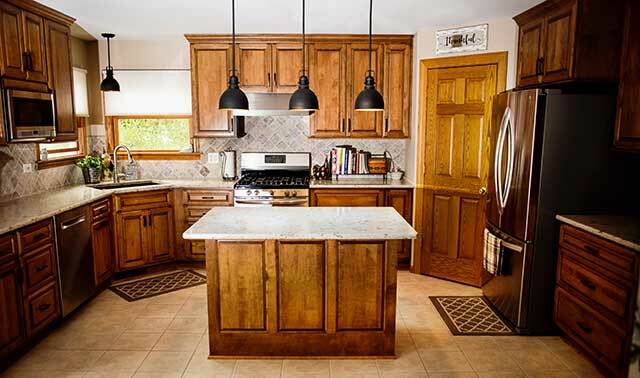 Professional design firms understand how to tie elements together, and they can use computer software to help a client visualize it, say Bob and Sue McDowell, of McDowell Remodeling, in St. Charles. When it comes to remodeling, there’s plenty of temptation to do it yourself, or to hire a friend. And given the dominance of online outlets like Amazon, it’s tempting to go your own route. But ask a professional kitchen and bath designer, and they’ll share many a horror story about clients who’ve called them only after a mess was made. It’s because of their experience, their knowledge and their network that reliable firms provide a key partnership during the remodeling process. Wegner, of Blue Ribbon Millwork, finds it’s not uncommon for homeowners to solicit input from multiple firms. It helps to provide key background, and it helps a homeowner to prepare an informed budget. Surprisingly, price sometimes is an indicator of quality. Sue McDowell, co-owner of McDowell Remodeling, often has a similar conversation with potential clients, when they ask why the price is higher than others. Professional firms like McDowell, Blue Ribbon Millwork and Geneva Cabinet Gallery separate themselves from competitors by providing in-house designers, a large network of suppliers and a longevity of trusted service. All three have been in business for 25 to 30 years and maintain a stable of reliable contractors and subcontractors. Just as important is personality. You’re going to be working with this firm and your designer for several months. Havlicek, who’s been in the industry for nearly 30 years, finds the best relationships “just click.” There’s a lot to be said for a designer who’s willing to listen to a client and reflect the client’s tastes, rather than the designer’s preferences. 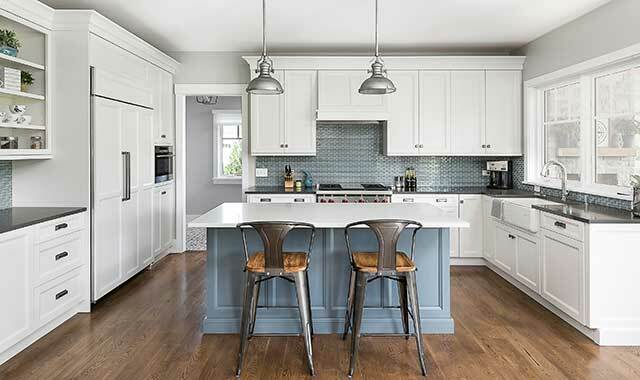 Be sure to ask a potential remodeler and their contractors lots of questions, say Dave Wegner and Megan Lebar of Blue Ribbon Millwork, in Woodstock. And, listen to the questions they ask you. A good contractor is paying attention to details. Once you’ve begun to settle on a remodeler, it’s important to check their references, too. Ask your reference when the job happened, who did the work, and whether the job stayed on budget and schedule, says Lebar. If it went over, ask for clarification. Sometimes, things are outside the contractor’s control. Ask your remodeler lots of questions, too. Ask if they’ve done other projects like yours, and ask about their suppliers and subcontractors. And always ask for a lien waiver, says Bob McDowell. “You are still liable for the contractor’s debt if they don’t pay their subcontractors.” For that matter, ask if the firm is insured and if it takes out municipal building permits. Less-reputable firms cut corners. Sue McDowell has noticed a rising trend in people buying components online and hiring someone else to install them. In theory, it’s a money-saver, but it’s usually too good to be true. There often are hidden costs, like the other materials required for installation, she says. When a product says “front door delivery,” nobody’s moving that heavy vanity upstairs for you. Parts may be missing or damaged, or they may look entirely different than they looked online. Now that you have your remodeler chosen, it’s time to get to work. Because you have an expert helper by your side, you’re not alone in navigating the overwhelming task of selecting cabinets, counters, floors, tiles, appliances and other details. The team at McDowell Remodeling takes clients shopping for all of the finishing touches, including cabinets, counters and tiles. Working alongside their designer, clients can see upfront how all of the pieces come together. At the same time, the designer can advise how different selections align with the client’s budget. Because it’s sometimes hard for a client to visualize their future room, kitchen designers like Thomas, Wegner, Lebar and Havlicek also create computer renderings, so clients can “walk through” the finished product. Firms like Blue Ribbon Millwork and Geneva Cabinet Gallery maintain showroom displays that provide another glimpse into the final product. With samples of woodwork, countertops and other accents also on display, the showroom is a critical step in the process. When something isn’t sold in-house, firms usually connect clients with reputable vendors. Shortly before construction begins, expect a home visit or two from your contractor and designer. They’ll be interested in final measurements, and reputable ones will ask lots of questions, to clarify the scope of the job, says Wegner. They’ll also want to poke around in attics, crawlspaces, basements and walls. Remember, the client has ultimate control. If something doesn’t feel right, speak up. This is your home, after all. Many local homeowners are finding themselves in a dilemma. They’re ready to downsize, but most anything they find needs some degree of remodeling. With the money they’d spend on fixing up another home, they’re finding it’s sometimes more economical to build new or invest in their current property. When those clients finally do commit to a remodel, they’re amazed at the results. This entry was posted on Monday, September 24th, 2018 at 12:00 pm	and is filed under Home & Garden, Top Posts. You can follow any responses to this entry through the RSS 2.0 feed. Both comments and pings are currently closed.